With the cessation of the Library of Congress Information Bulletin, its editor, Audrey Fischer, described a redesigned publication slated to succeed it: “With the advent of e-zines, iPads and other mobile devices, it was time not only to consider new distribution methods, but to rethink the audience, content and visual presentation of the Library’s magazine.” Library of Congress Magazine (LCM), became the online “bi-monthly, general interest magazine” showcasing the Library’s collections and staff. 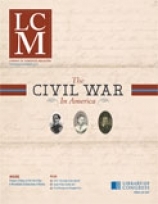 The first issue re-introduces the Library of Congress to readers through the prism of the War of 1812, with the burning of the Capitol building and the congressional library within. To re-establish the library, Thomas Jefferson offered to sell his personal library to Congress. After wrangling and arguing over the practicality of a collection covering a wide range of topics—and in foreign languages!—the United States acquired the six thousand-plus volumes in 1815 and began its ongoing work to become the largest library in the country, and, by 1992, the largest in the world, with the acquisition of its 100 millionth item. This fascinating story is continued into the 21st century with the digitization and accessibility of millions of unique items, such as the rough draft of the Declaration of Independence and the first films of Thomas Edison. There is something here to pique everyone’s interest! Every American should take some time to visit the Library of Congress through the Library of Congress Magazine (LCM).